Looking to give your camper an exciting Spring Break experience? 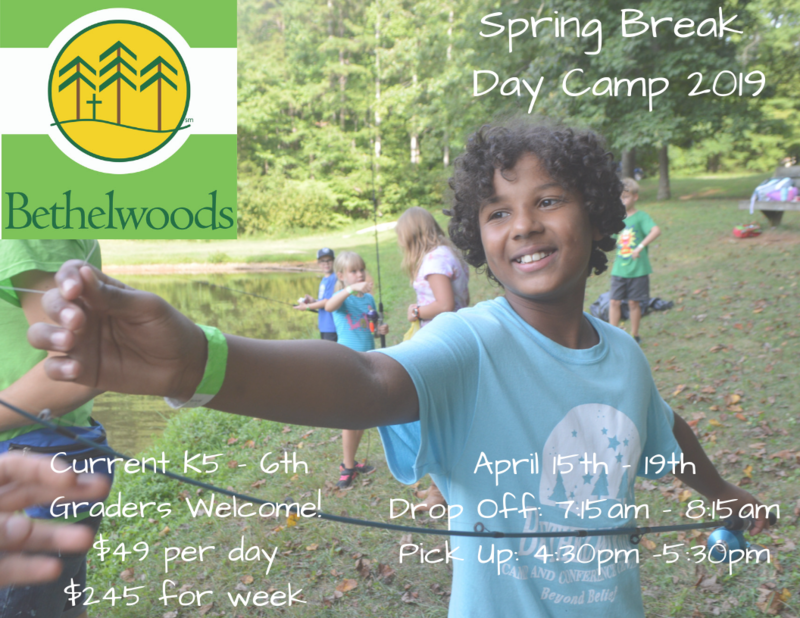 Bethelwoods is proud to offer our Spring Break Day Camp, which incorporates many of our camp favorites for those currently in K5 - 6th Grade. A week of games, s'mores, and Bible study, campers will develop friendships and faith in this week-long camp. Price includes Breakfast and Lunch. This week will feature special programs, including a guest Beekeeper! Click the 'Register for Camp' tab in the top right! Q: What should I send with my child? A: The usual basics for Day Campers are closed-toe shoes and a water bottle. We'll spend a good portion of each day outside, so be sure to get the sunscreen! Q: What if my child has a dietary need or allergy? A: Bethelwoods is able to accommodate dietary needs and allergies, such as peanut allergies or GF diets. Be sure to note this information on your child's Health Form during registration. Q: Will my child be with kids their own age? A: We divide campers into separate groups based on age. During Spring Break Day Camp, this usually means a K5-2nd grade group and an older group. Q: What if my child is a picky eater? A: Bethelwoods provides child-friendly breakfast and lunch, included in the price of registration. We make sure to include a variety of options, and always keep PB&J as handy back-up. Q: What training do the staff receive? A: All Spring Break Day Camp staff have prior experience working with campers at Bethelwoods, through Summer Camp or Kids' Night Out programs. Each camper group has a First Aid/CPR/AED certified counselor assigned to them. Q: What activities will campers participate in for the week? A: Campers will have the opportunity to fish, canoe, play Gaga Ball, Arts & Crafts, and daily Bible Study, among many other games and special themes. Q: Do I have to register for the entire week? A: For Spring Break Day Camp, we do offer the options of registering for particular days. Space is limited and does fill up, so early registration is advised.